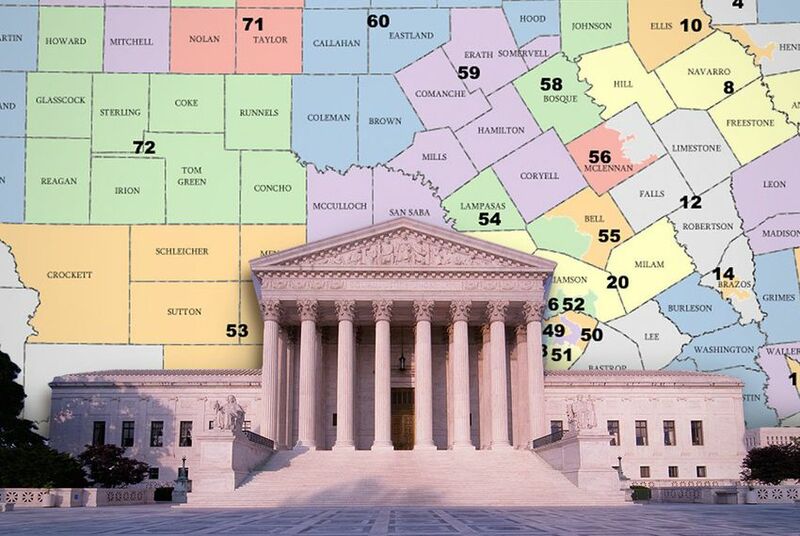 The U.S. Supreme Court dismissed the efforts of Texas Democrats and other plaintiffs to revive a partisan gerrymandering legal claim in the ongoing litigation over the state's political maps. As it considers cases out of other states over whether extreme practices of partisan gerrymandering can be deemed unconstitutional, the U.S. Supreme Court on Tuesday dismissed the efforts of Texas Democrats and other plaintiffs to revive a related legal claim in the ongoing litigation over the state’s political boundaries. The high court’s dismissal comes just days after it agreed to hear a case over whether Texas’ congressional and House district boundaries discriminate against voters of color. In that case, the state appealed a three-judge panel’s ruling against the state that included findings of intentional discrimination by state lawmakers, unconstitutional racial gerrymandering and violations of the Voting Rights Act. Flagging two congressional districts and nine House districts across four counties as problematic, the panel sided with the voting and minority rights groups who accused Republican lawmakers of discriminating against voters of color, who tend to favor Democrats at the ballot box, in drawing the maps. For years, the state has denied targeting voters by race and has admitted instead to practicing partisan gerrymandering by overtly favoring Republicans in drawing the districts. Pointing to Texas' “stark admission” that lawmakers were “motivated by the Legislature’s desire to dilute the voting strength of Democratic voters,” the Texas Democratic Party and other plaintiffs had asked the Supreme Court to reconsider the three-judge panel’s decision to dismiss partisan gerrymandering claims in the case in 2011 and 2014 without any discovery or trial. But the Supreme Court on Tuesday agreed with state attorneys who had argued that the court lacked jurisdiction to consider the party’s appeal. Though the high court on Tuesday did not provide an explanation for why it lacked jurisdiction, state attorneys had argued, in part, the high court did not have jurisdiction over the appeal because the Democrats had not appealed final orders in the case. Proponents of the maps put forth similar objections to the state's appeal of the racial gerrymandering findings in the case. On that front, the high court postponed consideration of the questions of jurisdiction until its hearing, which has not yet been scheduled. The fight over partisan gerrymandering in Texas, where Republicans hold a majority of seats in the Legislature and the state’s Congressional delegation, is probably not over. The high court could decide this year whether partisan gerrymandering can be ruled unconstitutional. The court last year heard arguments in a Wisconsin case over the limits of partisan gerrymandering, and a ruling in that case is pending. The court has also agreed to consider a partisan gerrymandering case out of Maryland.